If you are like me you are still scrambling to get those last few gifts for loved ones. We just received a great new line of tools and projects for kids! As a mom of two little girls I am always looking for ways to get them building and to help them improve their dexterity. My parents had me out on the house building site at a very young age and it has always made me feel as though I could tackle any project . . . sometimes to a fault. But I would not trade it for anything. Please visit our store on Route One in Woolwich or Online to see this collection. There is still time to get these to you by Friday. 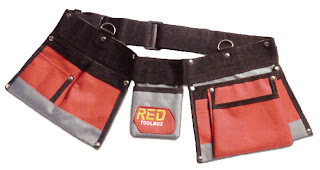 We have tool belts, gloves, bug barn kits, birdhouse kits, air hockey kits, tool sets and even a real cordless drill just for kids -- it comes with bits! What could be more exciting than your very own, properly sized tools? DISCOUNTS ON SHELTER CLASSES ARE INCLUDED THIS YEAR FOR THE FIRST TIME EVER! Sign up online, in person, or over the phone this Saturday, and you will receive 20% off tuition on any class in 2013. Discount will be applied at time of registration. All registration rules apply during the sale. Admission is free. If you can't make it to the sale at our store in Maine, it's available at Shelter Tools online all weekend long! If you saw it in the store and can't find it online, we will accept phone orders during sale hours on Saturday, 9-3 Eastern. The Tool-a-Palooza sale does not apply to timber frames. The Shelter staff recently traveled to the Common Ground Fair in Unity, Maine, and two tools our customers frequently requested were carving knives and marking knives. We now carry two new carving knives. The Mora knives by Eric Frost are made in Sweden with laminated steel. They have a Rockwell hardness of about 62 and they come razor sharp. The 2.5-inch blade model has an overall length of about 7 inches, and the 3-inch blade model has an overall length of about 7.5 inches. Each knife has a rubbed oil birch handle and comes with a plastic sheath that can be attached to a belt. They're ideal for carving, marking, whittling and more. This is a knife to last a lifetime. We're also carrying a marking knife made by Gladstone. This is a marking knife that we all like—no LOVE—including the price (just $11). This Gladstone knife has a double-beveled blade on one side so you can use it left or right handed as you layout your joints. The rosewood handle is nicely shaped, so it is easy to hold the knife like a knife or like a pencil. The overall length is 7inches, and the blade length is 1.5 inches. Now there's added incentive to purchasing a Tormek T-7 Sharpening System. From November 1 through the end of December, Tormek is offering a free EKA Chef's knife (valued at $165) with the purchase of a T-7. 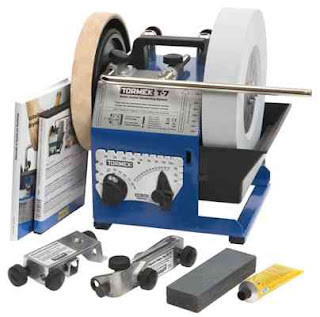 The Tormek sharpening systems make great gifts for the holidays. And if you act now, you get a bonus gift for yourself or for someone else who likes to cook. 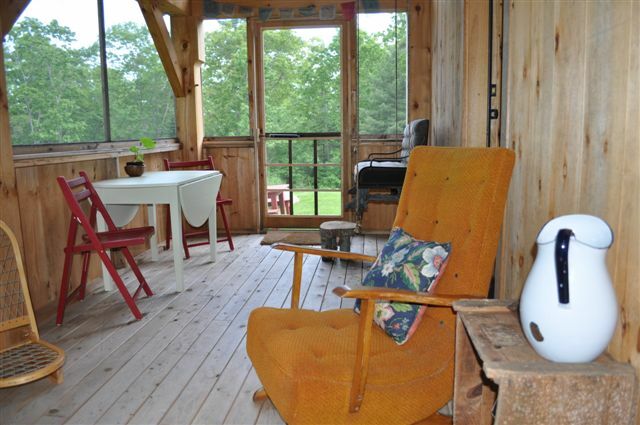 Now is a great time to buy a woodstove. Shelter carries the high quality line of Vermont Castings stoves and inserts, and they are truly things of beauty. We're happy to help you find the right size and type of stove for your home. From now through October 21st, Shelter customers can save up to $500 instantly on select Vermont Castings stoves and inserts. To qualify for the instant rebate, visit Shelter and purchase a qualifying stove or insert. 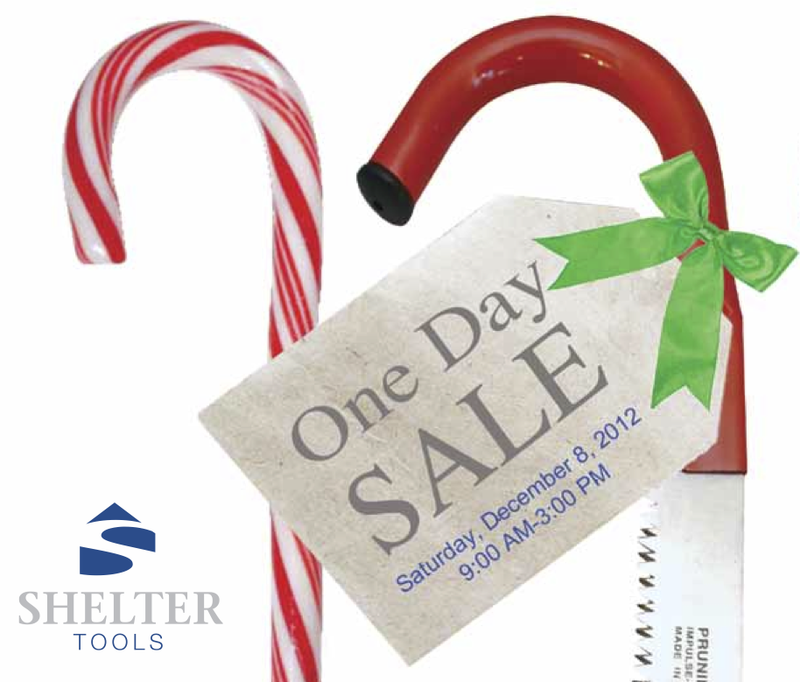 Call us at 207-442-7938, visit the Shelter Tools store, or click to read more below. 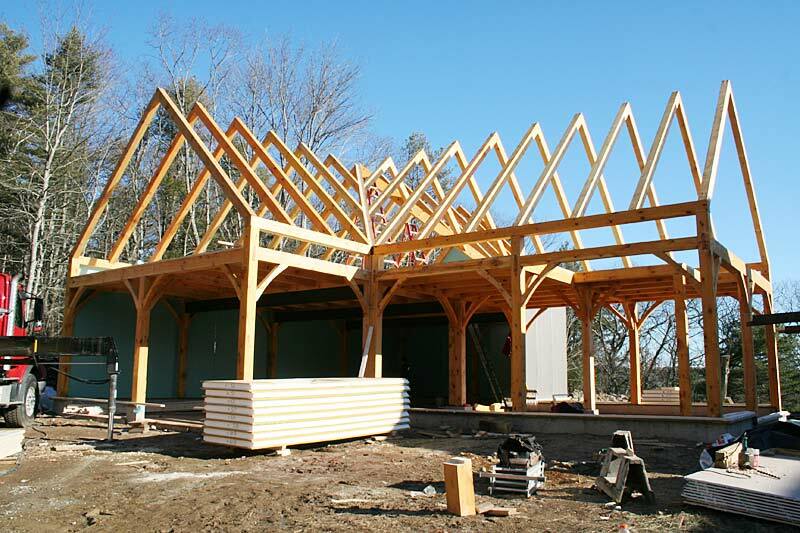 If you've been dreaming about our 24x24 timber frame kit becoming your very own home, garage, barn, studio, workshop, boathouse, guest cabin, retirement home, escape, vacation home, you're in luck. We have three 24x24 frames sitting in our shop, and we're taking $3,000 off of the list price bringing it down to $18,900 for the kit. 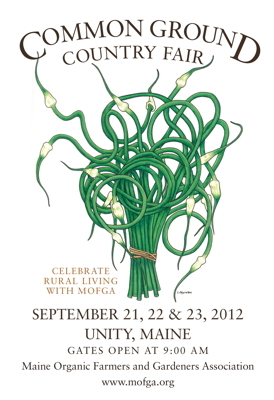 Come and visit Shelter at the famous Common Ground Country Fair in beautiful Unity, Maine (map) this weekend, September 21, 22, and 23. Gates open at 9:00 am. If you’ve ever been to the Fair, you know — and if you haven’t been, anyone who has will tell you — it’s an event like no other, that brings together so many people from so many walks of life, all in the spirit of celebrating the rural and agricultural traditions of Maine. Shelter will be displaying great woodworking and backwoods tools including Japanese saws, Flexcut carving tools, woodturning tools, the Tormek Sharpening system, froes, saws, and an assortment of woodworking and building books. We'll also have a great selection of composting toilets, backyard composting units, and composting tools. Shelter will be in the "Farm and Homestead" section of the fairgrounds (map). 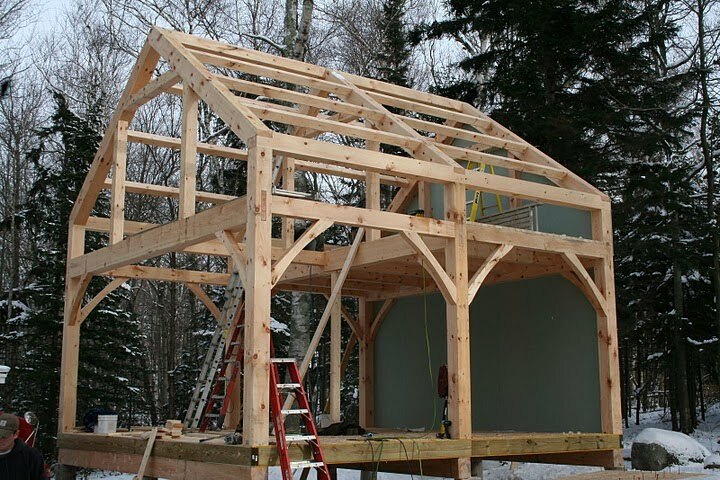 You won't be able to miss our booth at the show, which will feature a gorgeous 8' by 8' timberframe in douglas fir. 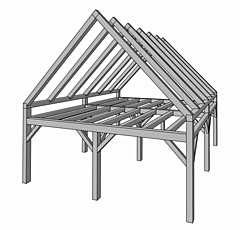 It demonstrates through tenons, trusses, wedges, and birdsmouth joints. More information about the fair can be found on the MOFGA website. There's a lot of admission details, so be sure to plan ahead and check out the website. We recently traveled to East Hampton, Connecticut to raise the Governor William A. O'Neil Performing Arts Gazebo in Sears Park, located right on Lake Pocotopaug. Mr. O'Neil, an East Hampton native, was a popular governor of Connecticut from 1980-1989. The gazebo bears his name in hand carved letters with flat black relief in crisp contrast to the western red cedar timbers. In addition to the excellent natural rot resistance provided by the cedar, all the timbers are coated with our favorite oil-Land Ark Exterior. The structure of the building is complex-what appears to be a simple hip roof from the exterior proves to be much more interesting as you enter the building and look up. The hip rafters are actually carried by two clear-spanning, flat topped trusses, similar to what you would see flanking a railroad bridge. The two trusses run parallel to your entrance into the building, providing a clearly defined line of sight out to the lake. It is hard to decide whether to look out and admire the view or to look up and admire the view. The building tie-downs are stainless steel threaded rods concealed inside the 10x10 posts, attached to both the post and the concrete slab with acrylic based adhesive. The roof sheathing is a nominal 3x6 end and edge grooved plank, made from three plies of Douglas fir laminated to together, capable of spanning twelve feet. This product eliminates the need for jack rafters, resulting in a clean roof structure, consisting of only principle and hip rafters. The architect for this project was Cheryl Newton Architect LLC (www.cnarchitect.com) from Glastonbury, CT and the general contractor was Scope Construction (www.scopeconstruction.com) from New Britain, CT. If you find yourself in East Hampton, stop in and take a look-the gazebo is hard to miss when you walk or drive in. Park hours are 7AM-8PM. Join us for our very popular One-Day Concrete Countertop Class. Our next session is Saturday, June 16, 2012 from 9:00 am to 5:00 pm. Learn the physics of concrete and the essentials of steel reinforcement. See the physical characteristics of placing concrete and the tamping, vibrating, troweling, polishing, and finishing that goes into making concrete countertops. All in just one day. Read more about the class on our blog. Space is limited so please sign up today. Call (207) 442-7938 or email if you have questions. From now until June 30th, if you purchase a Tormek T-7, you'll receive a free rotating base (the Tormek RB-180, which sells for $55). With the rotating base, you can swivel the sharpening system 180 degrees to select the perfect position for sharpening. We purchased a T-7 several years ago for our timber framing shop to help with shop efficiency. Our crew liked it so much that nearly everyone of them went out and bought their own to take home. The T-7 comes with an angle jig, a stone grader, a square-edge jig and a dressing tool. It also comes with a how-to DVD and book. You will be able to sharpen all of your chisels and square edge tools right away, and Tormek makes accessories for nearly every shape and size cutting tool out there. We carry just about all of them. 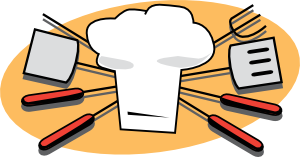 Are you shopping for another set of barbecue tools for your Dad? Don't settle for a boring Father's Day gift. Get dad a tool to help him get the job done right. We've got a great selection of tools and products for every dad from woodworkers, builders, boaters, cooks, to dreamers. Here are a few of our favorite Father's Day items. If you don't see the perfect gift here, then please email or call us for ideas. We hand pick and use all of the products we sell, so we are bound to have exactly what you're looking for. Granite or engineered stone countertops are nice, but they’re also very expensive. In our Concrete Countertops class, you’ll learn how to make polished and durable countertops that are very affordable and will bring style to your home. During the class we'll mix and pour two countertops (one in a mold and one in-place), and we'll pull a countertop out of its mold to polish and finish it. We'll teach you the subtle tricks of the trade to avoid cracking, voids, color variances, and thickness changes. Safety equipment is required (gloves, hearing protection, heavy work shoes, back brace as needed). We will have diamond stones, grinders and polishers on hand for you to try, so you will experience first-hand what tools and materials you will use to make your countertop. This class is VA approved for tuition reimbursement and qualifies for job training benefits as well as certification programs. Space is limited so please sign up today. Call (207) 442-7938 or email if you have questions. If you are not currently building or designing with Structural Insulated Panels, better known as SIPs, you have probably heard about them. 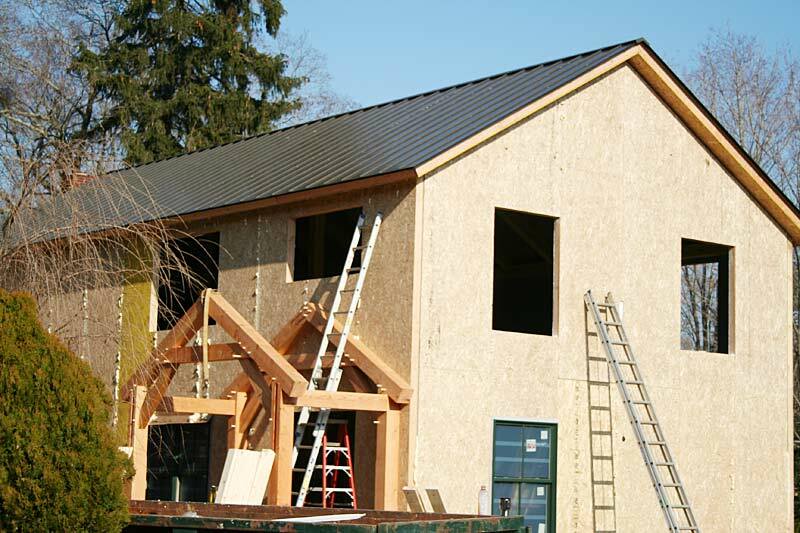 We are offering a free informational workshop entitled, "Structural Insulated Panels-Building a Better Way" on Friday, June 1, 2010, at our campus from 12-1:00. (Brown bag lunch available for $12.) This presentation is an AIA approved program and qualifies for continuing education units. Please contact us for more information. Congress and the President recently signed into law the VOW to Hire Heroes Act of 2011, which includes additional financial assistance to unemployed vets through the Veterans Retraining Assistance Program (VRAP). Shelter's Design Build class qualifies for this program. VRAP offers up to 12 months of training assistance to unemployed Veterans. The Department of Veteran Affairs (VA) and the Department of Labor (DOL) are working together to roll out this new program on July 1, 2012. The program is limited to 45,000 participants from July 1, 2012, through September 30, 2012, and 54,000 participants from October 1, 2012, through March 31, 2014. The program application is available on the VA website. The next Design Build class at Shelter is July 9-20. Enroll now to reserve your spot. Register today for the two-day Contract-It-Yourself course, May 26-27, at Shelter. If you're planning a building or renovation project, this is the class for you. Whether you work with a General Contractor or you want to be your own General Contractor this class will help you understand the building process and teach you how to finance and budget the project. We'll cover what kinds of contracts and additional insurance is needed for construction and how to ensure that the project goes without a hitch to completion. If you’ve heard about the Tormek sharpening system, you know what a fantastic reputation it has. The stellar grinding machine holds up in the most brutal of commercial settings, sharpens almost anything quickly and easily, and comes with an impressive 7-year warranty. But if you haven’t heard about the Tormek, now is a great time to learn about this addictive machine. Tormek is offering a special during the entire month of April: if you buy a T-3 during that time, you will receive a free stone grader with your purchase! Two stones in one, the stone grader (SP-650) allows you to convert the grindstone to 1000 grit for fine sharpening work—then just flip the stone grader over and revert the grindstone back to 220 grit when you’re done. 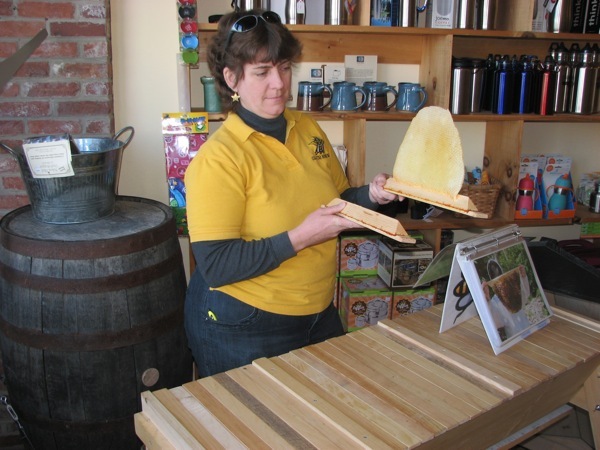 Shelter has again invited guest speaker, Christy Hemenway from Gold Star Honeybees, to offer a two-day "Intensive" beekeeping workshop on Top Bar Beekeeping April 14-15 at the Shelter campus. The class is designed specifically for those who want to get started keeping bees in top bar hives in the 2012 beekeeping season. Are you living or visiting the upstate New York area this weekend? Come check out Shelter at the 21st Annual Woodworker's Showcase in beautiful Saratoga Springs, New York! The show, located at the Saratoga Springs City Center and put on by the Northeastern Woodworker's Association, will feature lectures, demonstrations, and all kinds of examples of fine woodworking from across the region. Shelter will be displaying great woodworking tools including Japanese saws, Flexcut carving tools, woodturning tools, the Tormek Sharpening system, and an assortment of woodworking and building books. You won't be able to miss our booth at the show, which will feature a gorgeous 8' by 8' timberframe in douglas fir. It demonstrates through tenons, trusses, wedges and birdsmouth joints. Admission info, directions, and more information is available at the NWA website. Ladies, are you looking to gain some confidence when it comes to tools? Does the idea of building your very own timber frame home excite you, but you’re not sure how to get started? Or do you just want to be informed enough to talk to the contractor remodeling your kitchen about all your options? If so, you have to check out the deal we’ve got on our Tools for Women workshop series! If you’ve already taken Basic Tool Selection for Women workshop or have signed up for another course, consider adding the Sharpening, Hands-On Sawhorse Building Workshop, Power Tool Selection for Women, or our famous Post & Beam course—all designed just for women. Not only is this a great bargain, it’s a wonderful opportunity to learn something new about construction, tools, timber framing, and yourself. *If you've already taken a class in the series, it will count towards earning the discount. Alright, no more excuses. 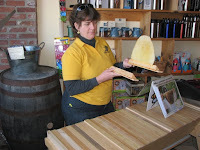 You heard about the Top Bar Beekeeping 101 class we offered at Shelter in February, but you were still in hibernation. Lucky for you, we had such a great time we’re offering the class again on April 14 and 15. Time to wake up, sign up, and learn all about getting that honey! Tickets are $12 for adults and can be purchased online. Children under 15, active duty police, fire, and military with ID get in free. The list of exhibitors includes Fine Woodworking, Lee Valley, Veritas tools, Kreg, Delta, Bosch, Bessey Tools (more clamps! ), and many more. There will be lots of free stuff, tools on display, and discount buying opportunities. The show also offers an impressive list of educational seminars (PDF). We're very happy to be part of such an impressive lineup. If you can make your way there, please stop by and see us. Or follow us on Facebook or Twitter to read updates from the weekend. I told you about how my Mom always said, "A woman may not have the strength to bash a beam into place, but she’ll find a way to get it there one way or another." Having the right tools and a creative mentality are key to making that happen. Having SHARP tools is just as critical. Although I'm a woman and I've been in this field since before I could walk, I've forgotten how hard it is to get comfortable in the tool world when you are a woman. It shouldn't be. So we are going to make it easier by offering a series of workshops just for women. Those of you who joined us for the Basic Tools Workshop requested the Sharpening Workshop and here it is! We will spend five hours teaching you how to sharpen everything from kitchen knives to chainsaws, axes and drill bits and how to understand the technique so that you feel comfortable sharpening nearly anything. You're welcome to bring an item that you find difficult to sharpen or one that you want to be able to sharpen on your own. We'll give you the skills to do it. Shelter Institute has organized a new series of weekend workshops at the Shelter Institute Campus, starting this weekend. February 4, from 9:00-1:00: Blueberry Beeton is offering a four-hour workshop in Basic Tool Selection for Women. 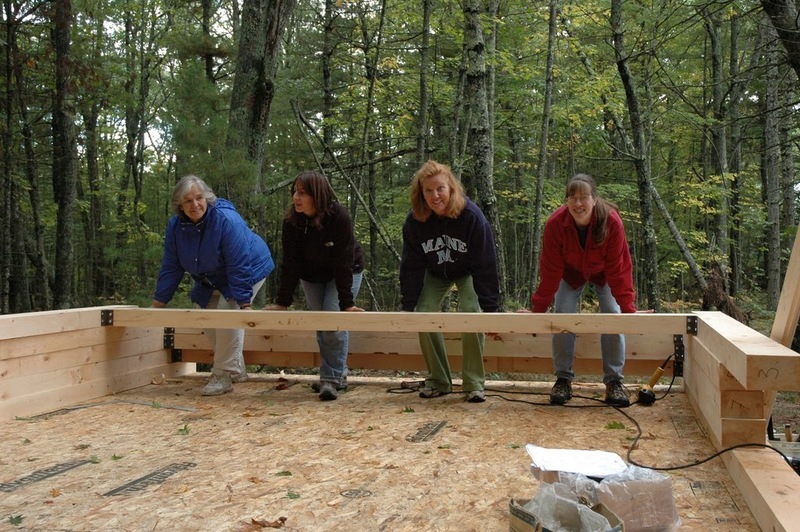 Patsy Hennin, co-founder of Shelter Institute, often said, “A woman may not have the strength to bash a beam into place, but she’ll find a way to get it there. Having the right tools and a creative mentality are the keys to making that happen.” Blueberry will discuss what hand tools and power tools to look for and how to evaluate them based on use, budget, and fit for a woman’s frame. She’ll list the tools everyone should have on-hand regardless of where one falls in the spectrum of house building, renovating, maintaining, or woodworking. Tuition is $45 per person. Register online today to reserve your spot. By Blueberry Beeton, Shelter Staff—You know that piece of trim that needs to be replaced, or the door that sticks in the kitchen, or the light fixture you want to replace? You can do it yourself and many other much bigger projects with the right tools! My Mom always said, "A woman may not have the strength to bash a beam into place, but she’ll find a way to get it there one way or another." Having the right tools and a creative mentality are key to making that happen. A few years ago I gave a tool talk to an audience of women at a library in Damariscotta—the enthusiasm and standing ovation made me want to offer a similar class at Shelter. A couple of months ago I read an article in one of my FAVORITE magazines about tool selection and it was such a disappointment. It didn’t feature any of the really cool tools available. I like to buy great tools like I buy great shoes, dresses or cooking tools. So this new class is my version of that article in real life. This workshop will be a comfortable space to learn about tools, get your feet on the ground, and an opportunity to bring your questions and have a discussion! The show also offers an impressive list of educational seminars, including a seminar on tools offered by Shelter's very own Blueberry Beeton! Another seminar on making a hand plane and building cabinets is offered by Bob Settich, author of Built-Ins (in Taunton's Build Like a Pro series). He will talk about cabinetmaking details, plane techniques, and more. Maybe he'll get me motivated to start the built-in bookshelf/window seat I've promised my wife for years. We're very happy to be part of such an impressive lineup. If you can make your way there, please stop by and see us. Shelter has invited guest speaker, Christy Hemenway from Gold Star Honeybees, to offer a two-day "Intensive" beekeeping workshop on Top Bar Beekeeping February 11-12 at the Shelter campus. The class is designed specifically for those who want to get started keeping bees in top bar hives in the 2012 beekeeping season.